The past few weeks have been spent in preparation for our trip to Savannah, Georgia for QuiltCon, the wild travel adventure that was required for us to get there, the excitement of the event, and finally the long trip home. 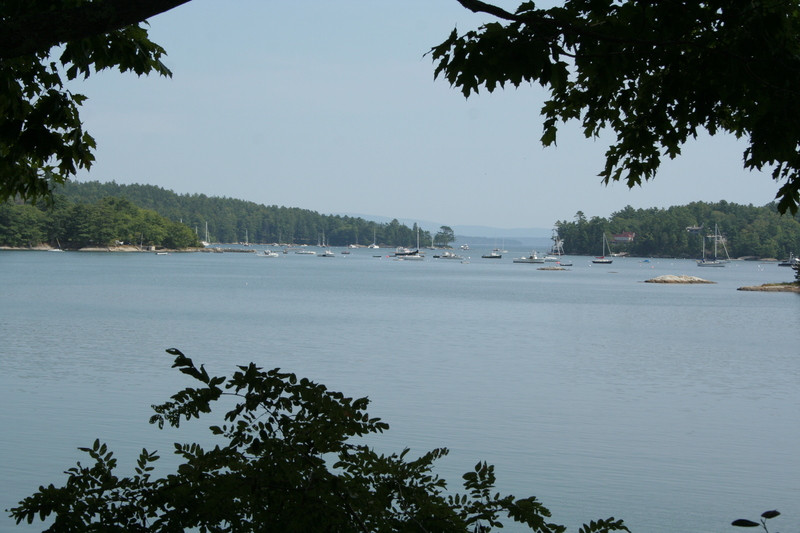 We arrived home late last Tuesday night after a day of flights and then a fully day’s drive with all three kids, having picked up the big kids who spent the week with my parents in New Jersey. 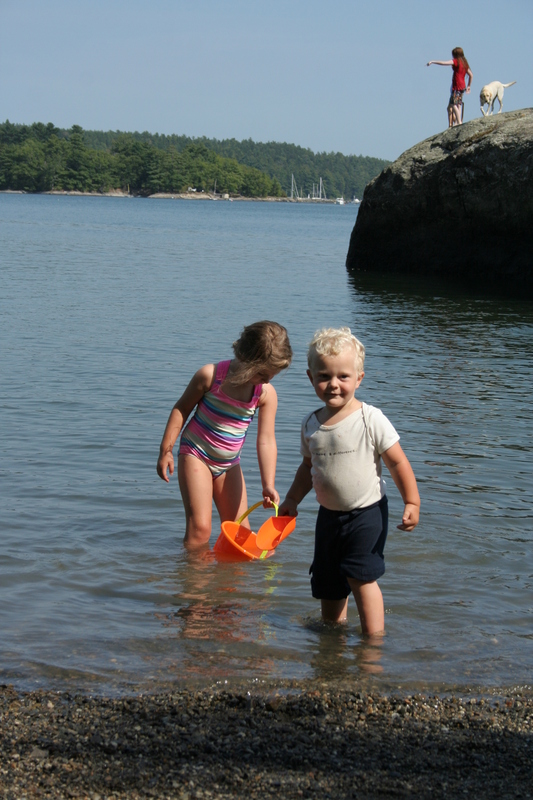 When we left home, Maine had 3 feet of snow and highs of 35, yet we arrived home to rain, patches of mud, and just a layer of snow in the yard. It’s amazing what a week can do! 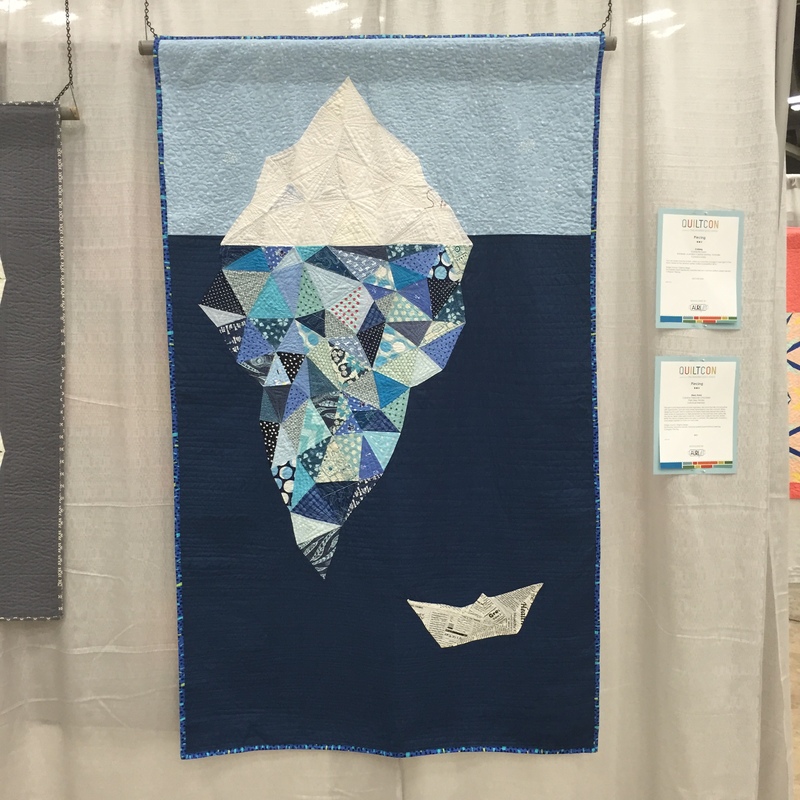 There are so many things I’d love to share with you about what I’ve been up to over the past few weeks and my experiences at QuiltCon, so I figured a quick post of highlights would be my best chance of getting it written clearly. I’ll aim to go into more depth for some parts in the days to come. 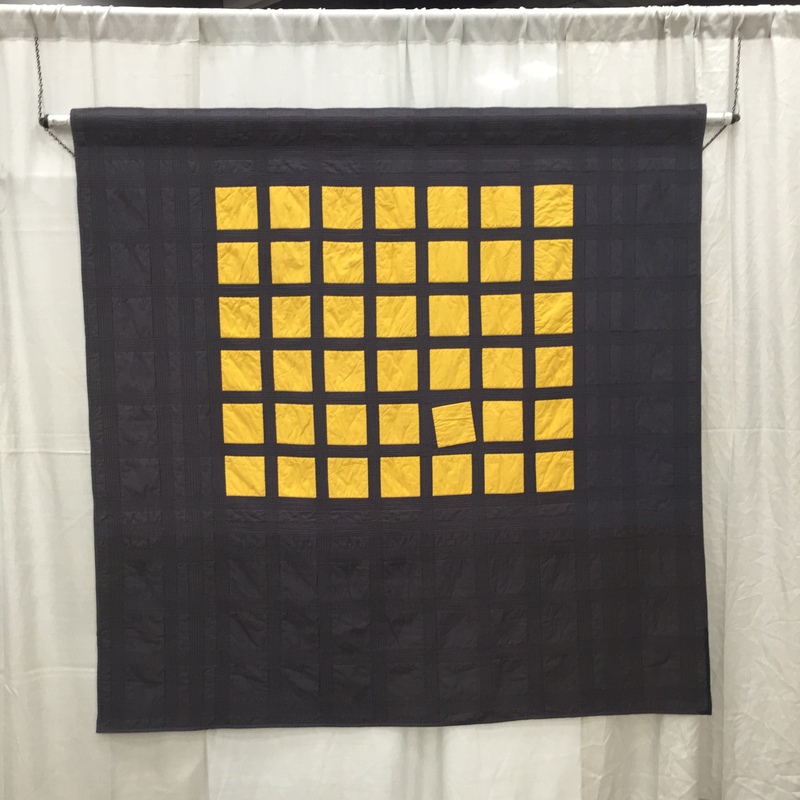 First and most exciting is that Andover Fabrics asked me to make an Alison Glass mini quilt to hang in their booth at QuiltCon. How could I say no to that honor?! I decided to go with my pattern Constant Flux, but printed the templates at 90% and rearranged the blocks a bit so that the large focal square was in the middle. I used all fabrics from the Seventy-six, Insignia, and Sun Print 2017 fabric lines by Alison Glass. I added a Wild Boho-inspired bee applique which I embroidered with 12wt Aurifil thread. Both dense 1/2″ machine quilting and colorful hand-quilting finished it off, and from what I heard, there was quite a buzz about it (har har buzz!). Here I am proudly standing next to the quilt hung in the fabulous Andover booth. Trying new things and stretching my mind are among my top favorite things, so I was sure to register for some workshops and lectures at QuiltCon. I focused on areas I felt I could most benefit from improvement or practice: improv, sewing curves, and improv free motion quilting on a domestic machine. I really loved the Minimalist Improv class with Season Evans. Her minimalist mindset and explanation of her process was so enlightening, and actually forcing myself to *try* a minimalist palette with improv piecing was so liberating. I made an entire mini quilt during the class, and didn’t touch a rotary cutter or ruler once (except for squaring the finished block). As much as I tried to go into the class with a blank slate mind, I had a preexisting idea to create a minimalist quilt focusing on a trianglesque shape in the upper right hand corner. I abandoned the angular construction plan to try my hand at Season’s style, but still snuck in the little triangle. It’s not as minimalist as Season would create, but it’s VERY minimal for me, I created it entirely improv, AND I love it. Total win! I also was inspired by Sherri Lynn Wood‘s lecture on finding the Flow with Improv, and took some really great ideas home with me as a result. I’m excited for the next chance I get to play with improv, since Sherri’s lecture inspires me to take a different perspective and tap into other experiences to help me overcome (or flow past) the usual brain-breaking path of uncertainty I traipse while attempting improv. Sew all the Curves with Jen Carlton-Bailley was another fun one! I was encouraged to learn that I am doing everything right when it comes to traditionally piecing curves, I just need more practice for it to feel smooth! It was also really fun to see the many styles and varieties of quilt patterns that incorporate curved piecing, photos of which Jen shared many! Improv Machine Quilting with Christa Watson was everything I hoped and more. It was such an organized class, with introductions to different motifs and then opportunity to practice on our practice pieces. I LOVE the idea of improv free motion quilting, since it takes some of the pressure off of my self-inflicted desire for perfection. 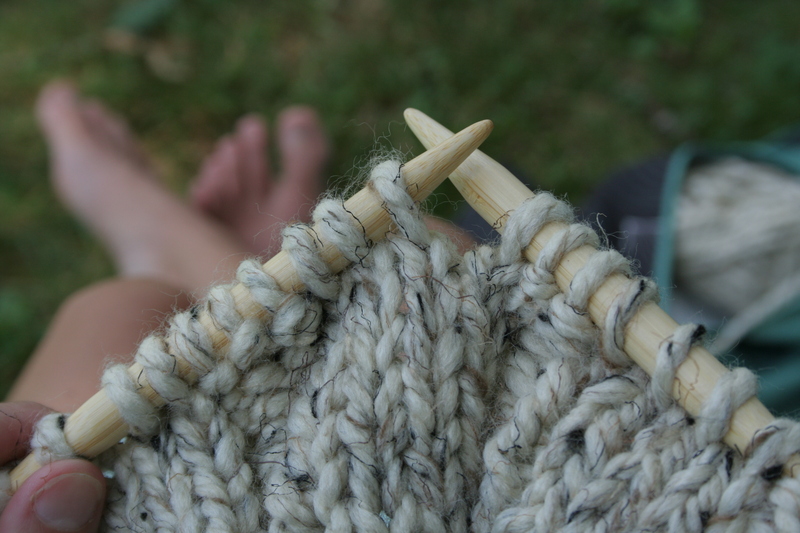 One tip shared by Christa that I especially love was, “The best way to hide imperfections is with more imperfections.” The human touch adds so much personality, story, meaning, depth…. and imperfections. I’m newly inspired to densely quilt the bajeezus out of some of my quilts, and embrace the flow that emerges. If you ever have an opportunity to take a class or attend a lecture with any of these talented women, I highly recommend it! I came home ready to celebrate my mistakes, find the flow whether I’m happy with the progress or not, sew curves until the cows come home, free motion quilt all the things, and allow myself to create minimalist creations from time to time as a stress-free palate cleanser. Plus, my husband really likes the mini quilt I made, so that’s a double win! Thursday morning when I first stepped foot onto the showroom floor, and began slowly walking around to take in the vast depth of beauty, originality, workmanship, and meaning that was displayed in those aisle, I was moved to tears. 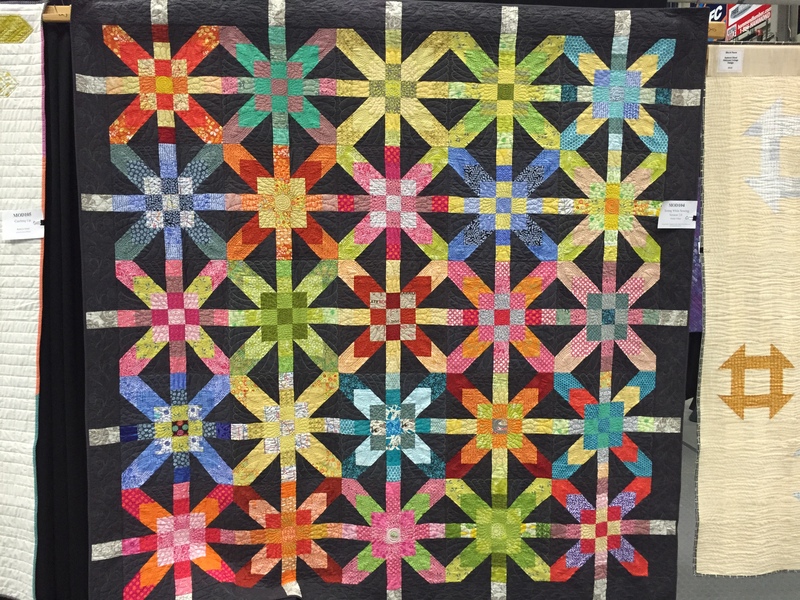 I don’t have the opportunity to attend many quilt shows, and being in the presence of so many quilts created with such passion by talented fellow quilters and friends was an amazing experience. 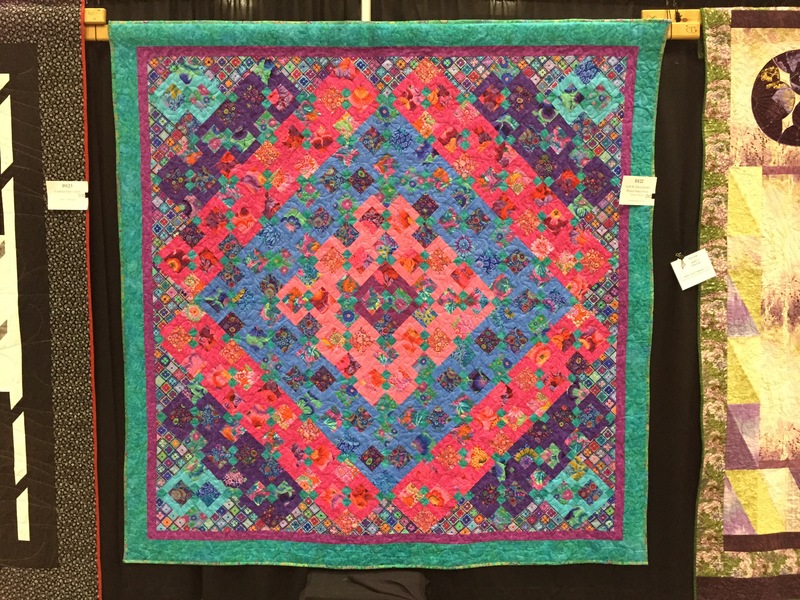 Despite keeping a fairly light class schedule, I am sure I did not get to see every single quilt that hung at the show, and more time was spent examining details than taking photos. It’s impossible to select favorites, so instead I will share a selection of photos I took of quilts that stood out to me. 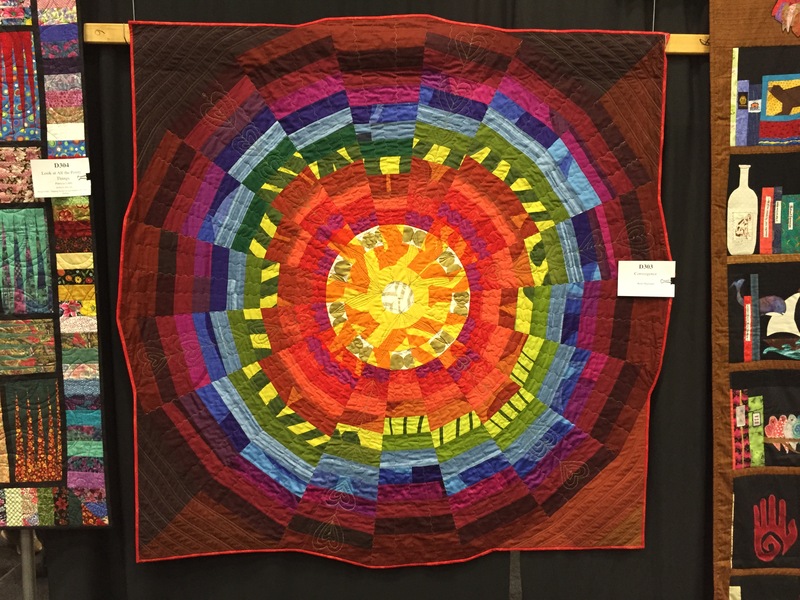 You can see all of the award winners on the Modern Quilt Guild website, here. Let’s begin with the Best in Show, since it was a pretty epic and gorgeous quilt. Bling by Katherine Jones @twocatsquilts was foundation paper pieced from solids based upon the inspiration of a princess cut diamond. 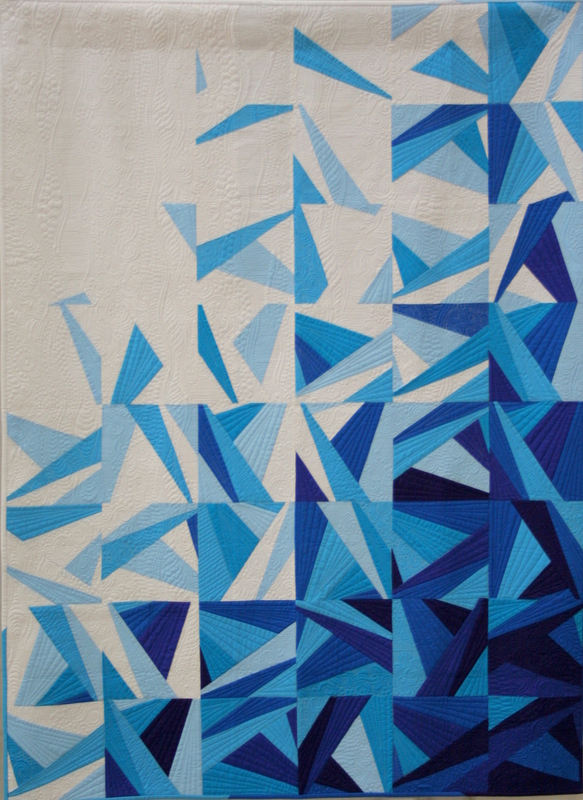 It struck me that the quilt is entirely foundation paper pieced, since that confirms that paper piecing has a strong place in the modern quilt world. Sure, it can help you create perfect shapes and images, but it’s clear now that it can also help take an abstract idea and break it into manageable, clear chunks. 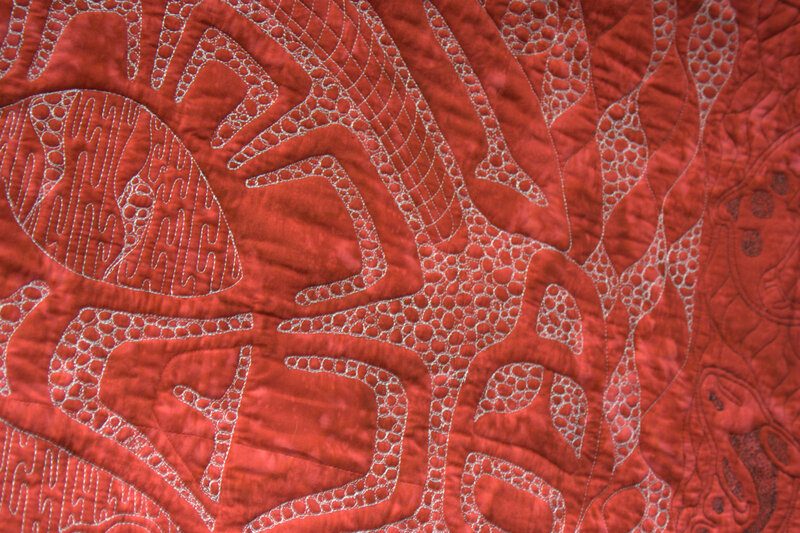 The quilting was dense straight line quilting on the diagonal, which did its job. Think about removing all of the papers after piecing this one! Astounding! …and Arches by Leah Pahlmeyer. 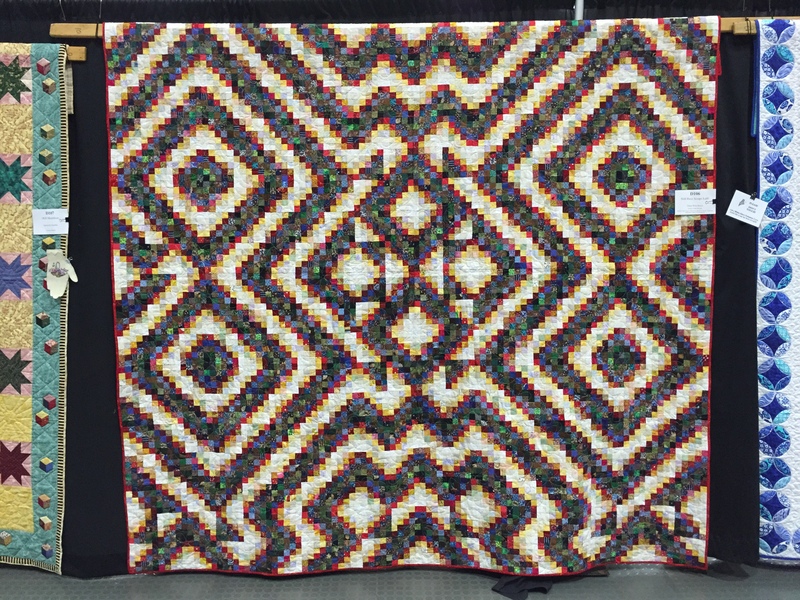 There were many more quilts with curves, both improv and traditionally pieced, and probably your best bet at seeing as many of them as possible is checking out the #quiltcon2017 or #quiltcon hashtags on Instagram. Statement quilts are still making a strong stand, which was both humbling and empowering to see. As Yvonne of Quilting Jetgirl reflected in her recent blog post about QuiltCon, many people use quilt-making as a tool in processing events, or perhaps create quilts out of necessity to help them process, creating some of the most beautiful and powerful textile creations I’ve ever seen. (Read Yvonne’s full post here for more examples and reflection!) I wish I had taken more photos of these powerful quilts, but reading the descriptions and doing my own processing of the inspiration dominated in their presence. 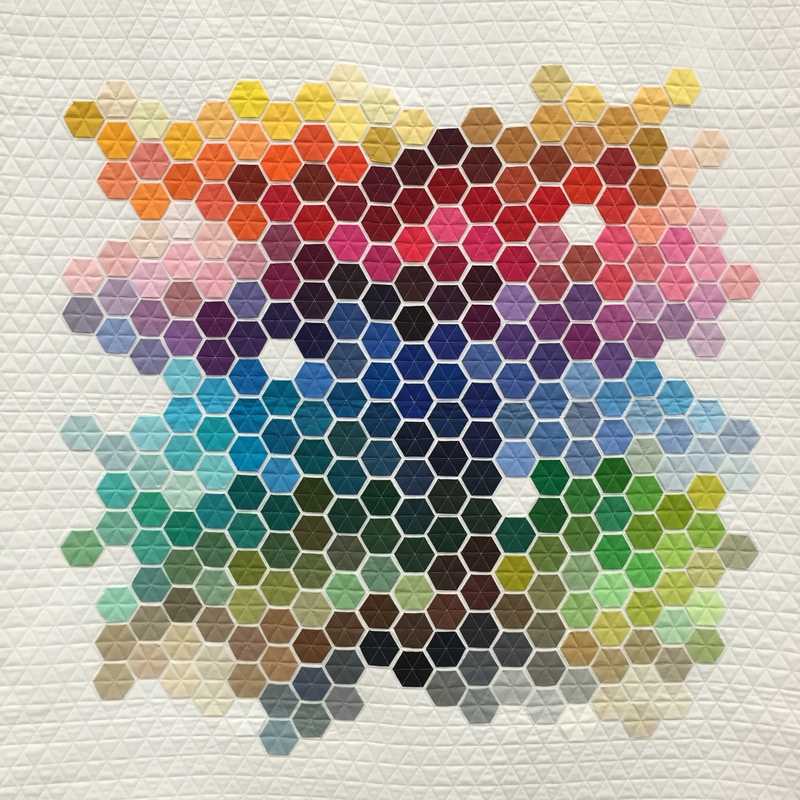 The quilt shown above is Tea and Skittles by Thomas Knauer @thomasknauer (Applique 2nd place), and stopped me in my tracks. Read the story here. Text in quilts also dominated, either boldly featured like in Autumn is Wistful by Chawne Kimber @cauchycomplete, subtly and not so subtly pieced like in Implied Consent by Colleen Molen @busybean (3rd place in Use of Negative Space), or quilted into the actual quilting, like in Minimalism with Meaning: The Story of Us, made by Hillary Goodwin @entropyalwayswins with the Bee Sewcial group blocks (below). Hillary tasked her beemates to make blocks that told a story about themselves and then quilted their words into the fully pieced quilt. 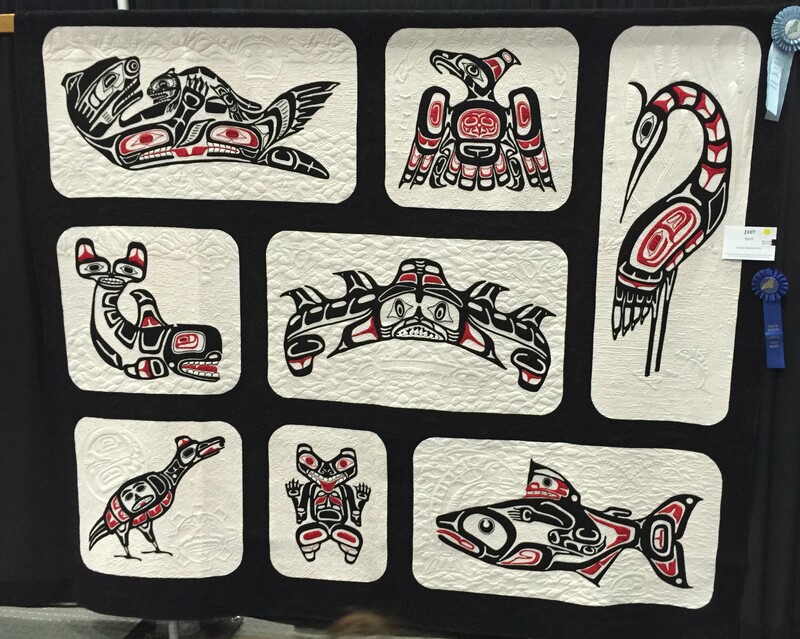 Quilts tell stories, truly, a fact that is abundantly clear at a quilt show like Quilt Con. Solid fabrics seemed to dominate, with tone on tone and subtle prints playing a stronger hand that bold large-scale prints. 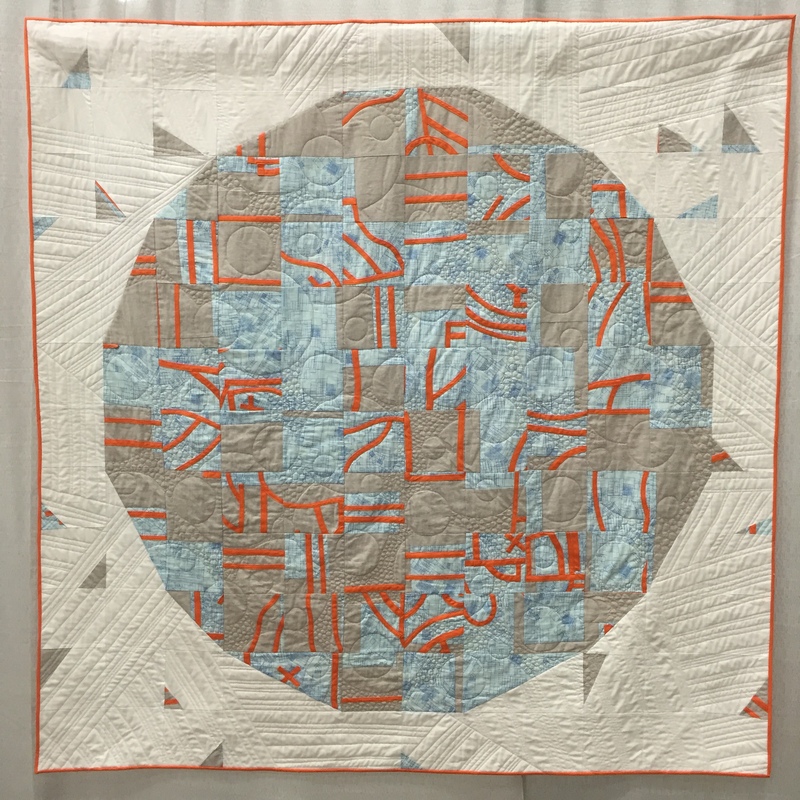 This Free Spirit Award of Quilting Excellence winner, Go North by Maritza Soto @sotosewn is a good example, as is the amazingly improv quilt Lincoln by Kim Soper @lelandavestudios (below), which won 1st place for Improvisation. I also was excited to see quite a bit of hand quilting and even embroidered details on quilts, which is right up my alley these days! 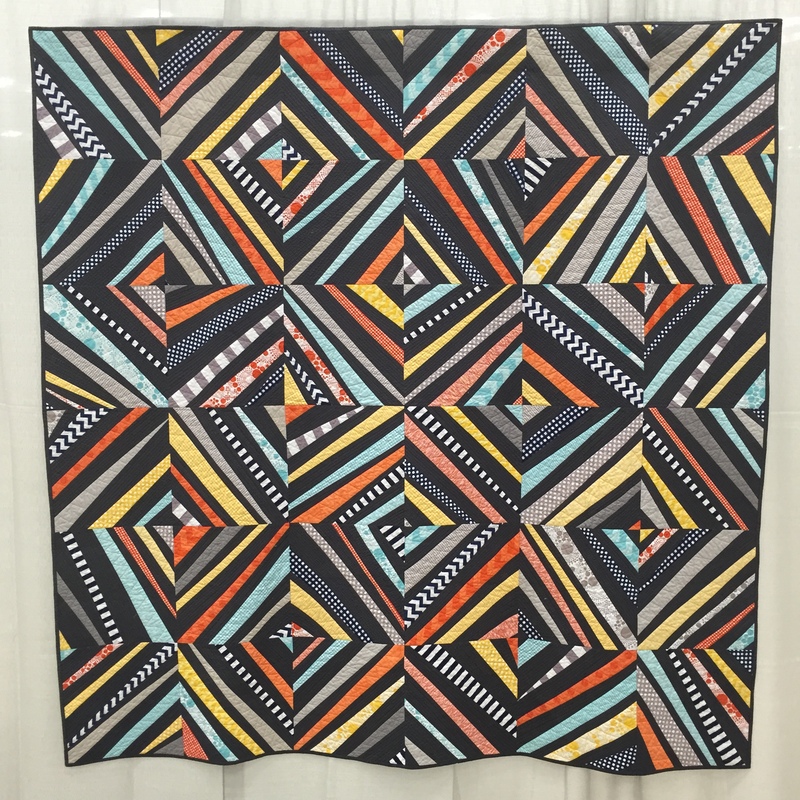 I loved this quilt Canary Meets Goldmine by Stephanie Ruyle @spontaneousthreads even before I realized it had won 1st place for Handwork. The full amazingness of this quilt cannot be realized until it is inspected from a nose-distance away. French knots!! Amazing, right!? 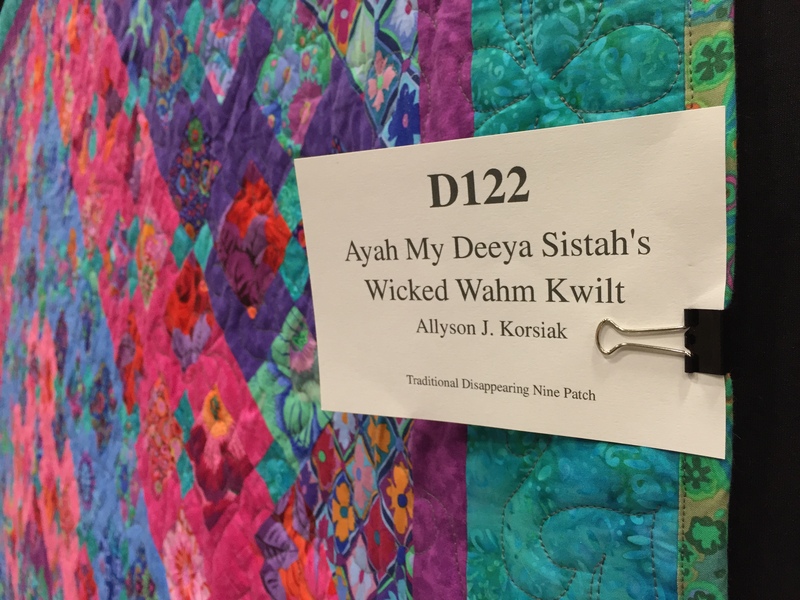 There were so many amazing quilts and seeing them firsthand, from a nose-distance away in many cases, truly inspired me to continue making beautiful things, to stretch the “rules” and create whatever moves me, continue fine-tuning my skills and techniques, and to attend as many quilt shows as I possibly can. The booths and vendor hall was much fun at QuiltCon. I was able to find replacement milliners needles right before my Facebook Live chat with Aurifil thread, thanks to Red Thread Studio, with quite a few offers of a loaner if I had not been able to find the right needle to purchase. It was exciting to see one of my local quilt shops, Alewives Fabrics, rocking the vending floor, too. 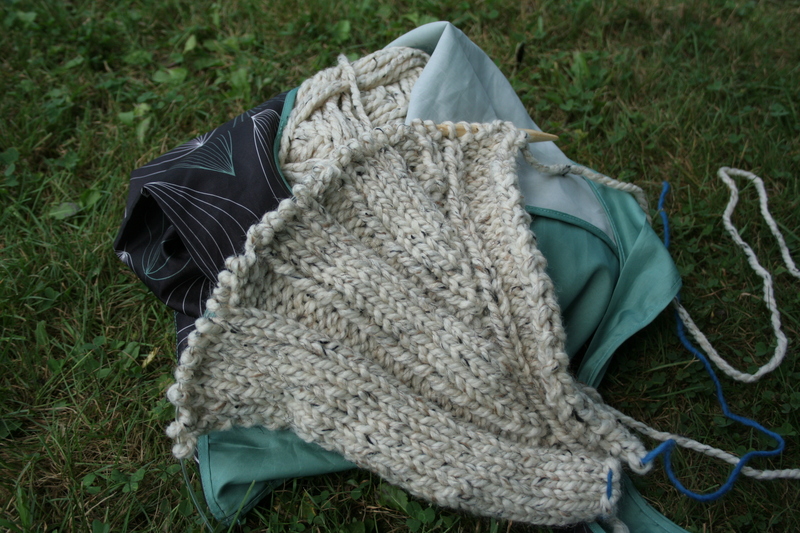 Their weekly Lucy Boston kits seemed to be a big hit. I loved playing around on a Handiquilter long arm machine, and can certainly see the appeal of a long arm after having tried it out first hand. I did not spend as much time at the booths as I would have liked, both because of fullllll days, but also because most of the time they were absolutely mobbed! 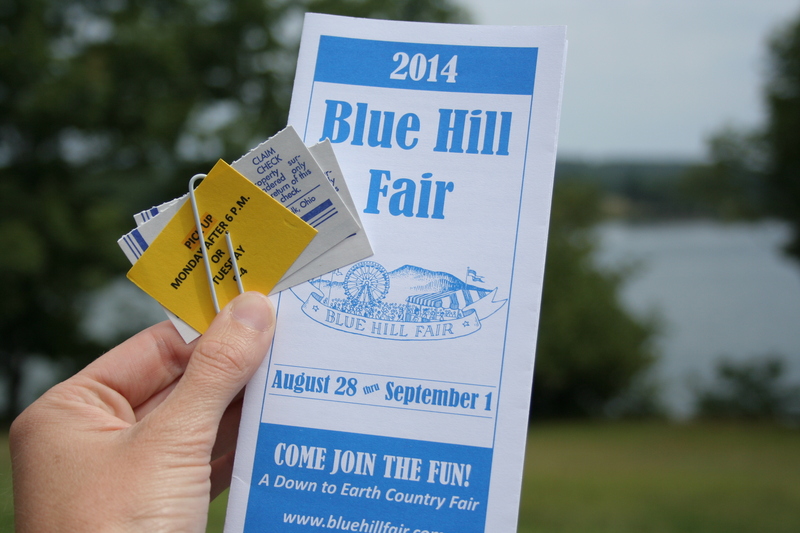 These photos were taken Sunday afternoon shortly before the end of the show, which is how you can see the booths. 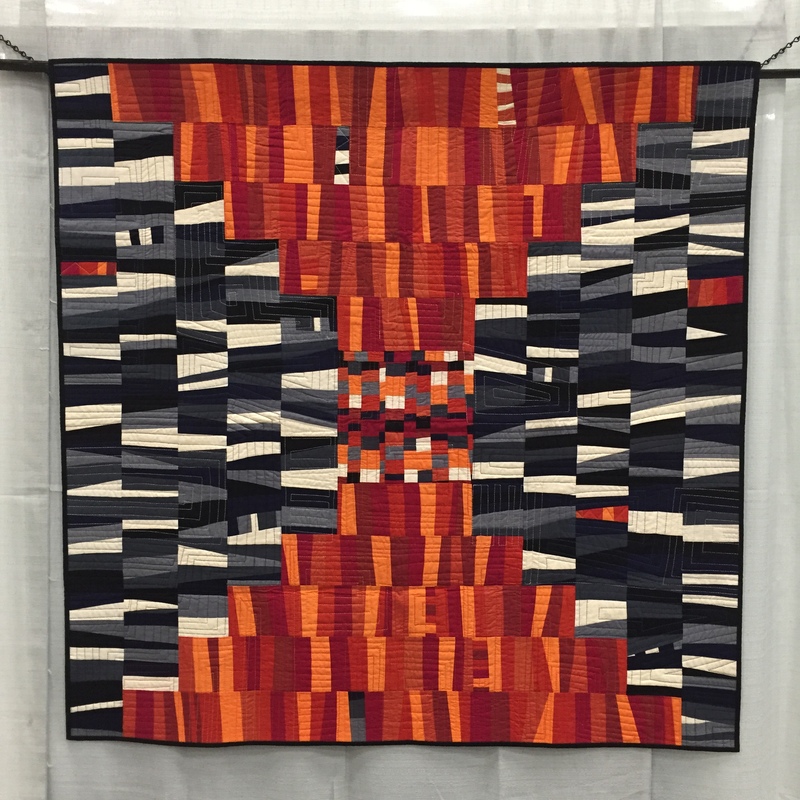 There were quite a few special exhibits at QuiltCon, including the quilts of Angela Walters, Siddi Quilts, Quilt Design a Day, Charleston MQG & Emanuel AME Church Project, The Modern Quilt Guild’s 2016 Quilts of the Month, Kona Color of the Year 2016, and The Pulse of Quilting (shown above). 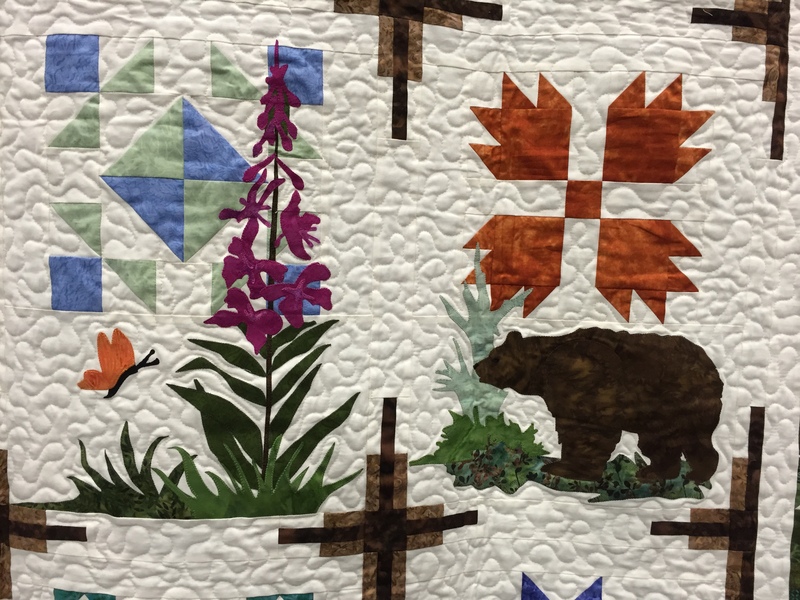 I honestly could have spent all four days just exploring these exhibits–there was so much to see, and so many powerful things being done through the gift and art of quilting. Stretching my brain to learn new things in classes, finding renewed inspiration in lectures, seeing row upon row of gorgeously mind blowing quilts, shopping a hall of vendors filled with all of my favorite things–all of these are wonderful, but none compare to the delight of seeing quilty friends in person. 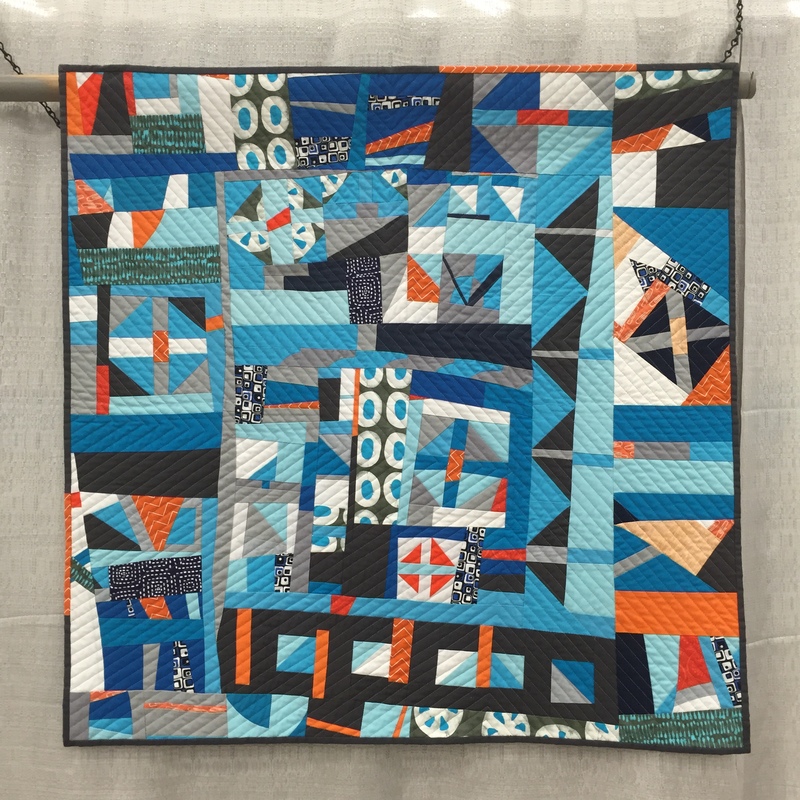 A highlight of QuiltCon will always be the personal connections made between friends old and new, the laughs shared over lunch, the deepening of friendships forged through blog comment exchanges and social media posts. 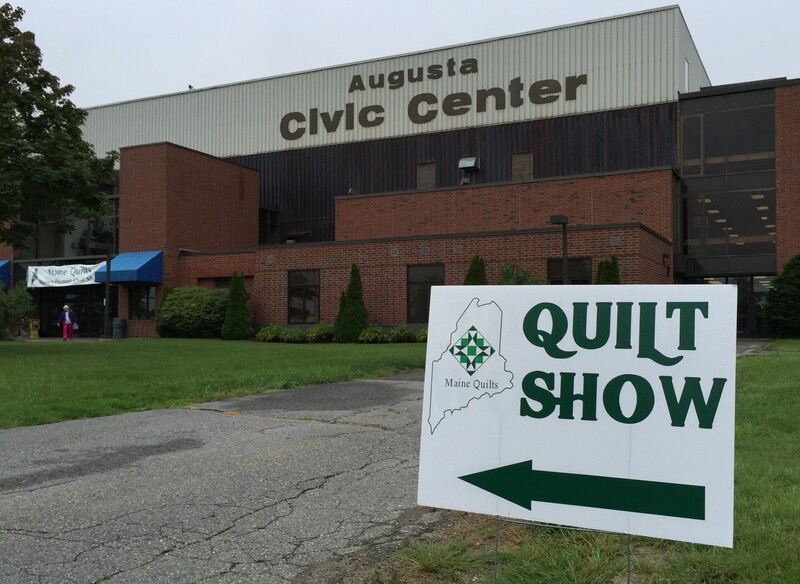 Call me a sap if you must, but seeing so many fellow quilters so full of enthusiasm and spirit fills my social quilting cup until my next chance to attend a big event. I took only a handful of selfies, but enjoyed meeting so many new friends, old friends, and even more new friends. This post would not be complete without at least a collection of photos from gorgeous historic Savannah, Georgia. It was especially fun to explore since my husband Garrett (who incidentally began an instagram account @knightquilter while he was there) and youngest son Finn were also there with me. I was sure to teach Finn the fine art of hugging trees, and he was a big fan of the birds chirping in the trees (I couldn’t hear them, but I confirmed their presence on several occasions to make sure I was understanding the source of his excitement). Savannah is a gorgeous city and I would absolutely return to explore more! I’m so grateful to my family for supporting me in my travels. Between my parents watching my older two kids, my husband not only taking time off work so that he could be with Finn full-time so that I could attend workshops, lectures, and “do my thing” with quilty friends I rarely see, but also begging for Night Quilter t-shirts to wear during the event, and taking an actual legit interest in quilting and the industry to help support and understand my passion, I am surrounded by the most amazing supports. Without that support, none of this would be possible, and no reflection on an event as amazing as QuiltCon would be complete without a huge, from the bottom of my heart, thank you. What an amazing week it was! When I realized that my Unlocked quilt qualified for the Large Quilts Category in this year’s Blogger’s Quilt Festival hosted by Amy’s Creative Side, I knew that I also wanted to enter one of the smallest quilts I’ve made to date: the teeny tiny modern hexies mini mini quilt I made for Jennifer at Little Black Cat Quilting as part of the #miniminiquiltswap. You can see my progress post on this mini mini here, and the finish post here. I am entering this mini mini quilt into the ROYGBIV Category, since I cannot let a year go by without a rainbow entry! This mini mini quilt makes me giggle. 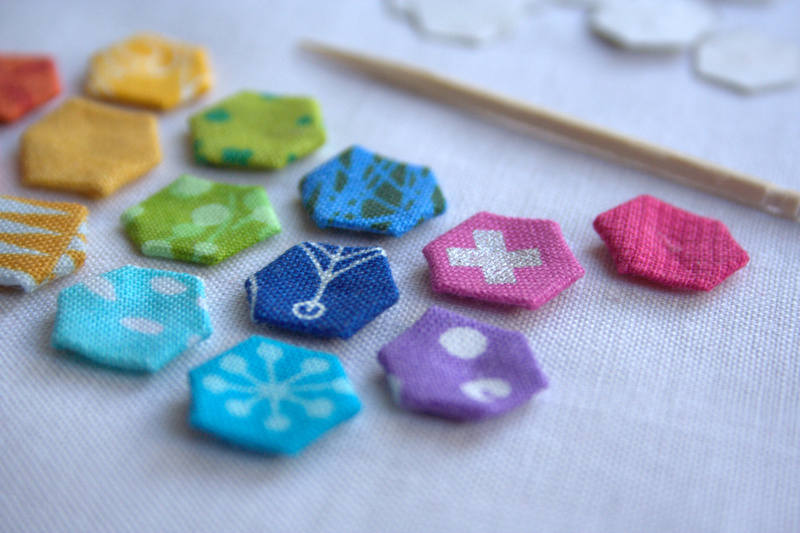 The English paper pieced hexies are 1/4″ each, and were hot-iron-basted in lieu of thread or glue due to their size. 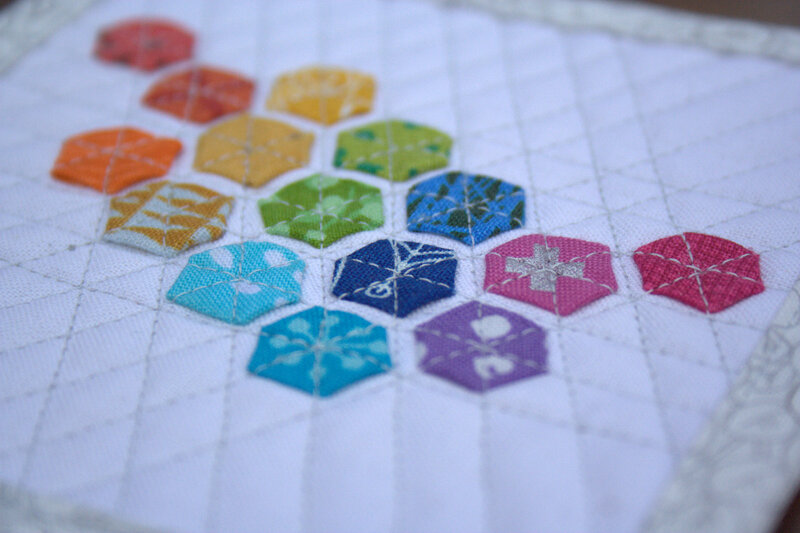 I then carefully removed the cardstock templates and followed this awesome tutorial by Nicole at Modern Handcraft to attach the hexies to the mini mini quilt, which finishes at 4 1/2″ square (18″ around–it would easily fit into the mini quilts category, too!). 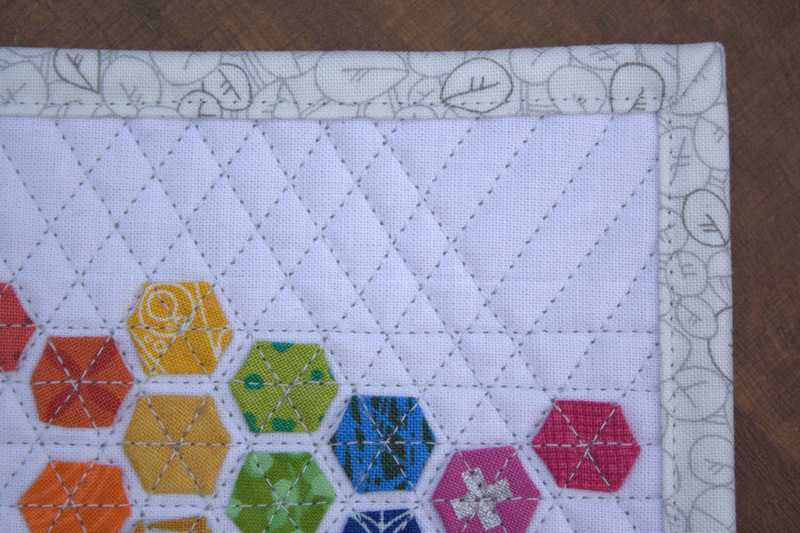 I love how teeny tiny the hexagons are, and how well the diagonal quilting worked despite slight wonkiness due to their teeny size. I quilted with 50wt Aurifil thread in 2600-Dove, using the walking foot on my Bernina 560. A single-fold binding with my favorite neutral from Carolyn Friedlander’s Botanics line finished this quilt in a subtle way, letting the rainbow hexagons be the stars. I really love this mini mini quilt and had such a fun time shrinking the pattern as much as my adult fingers could manage. The toothpick for scale in this process photo helps you see exactly how tiny these hexagons are! 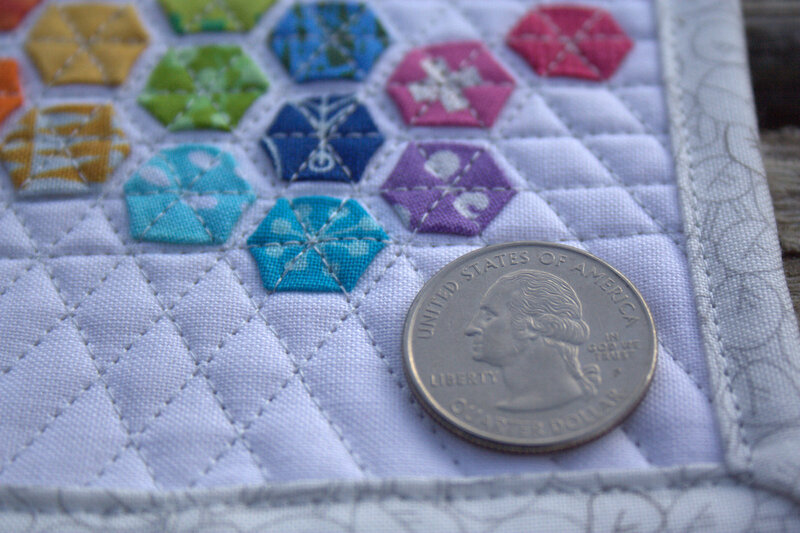 Just one more peek with a US quarter after quilting. 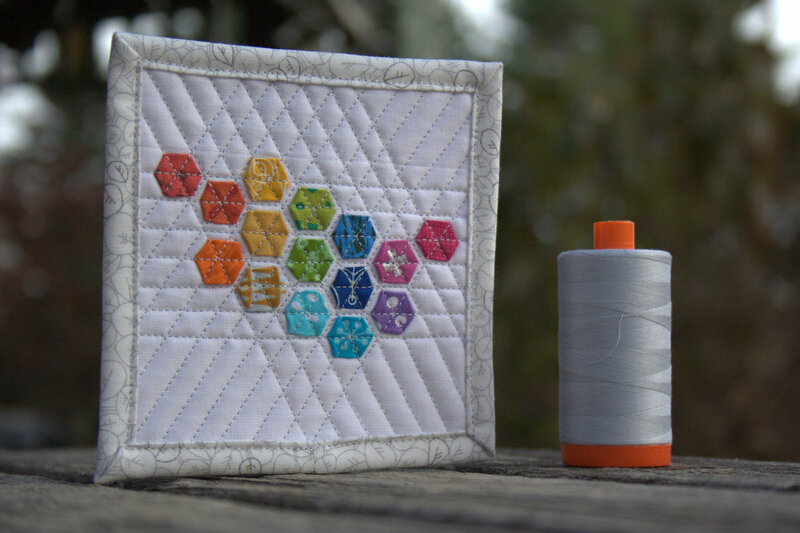 Such cute little hexies! 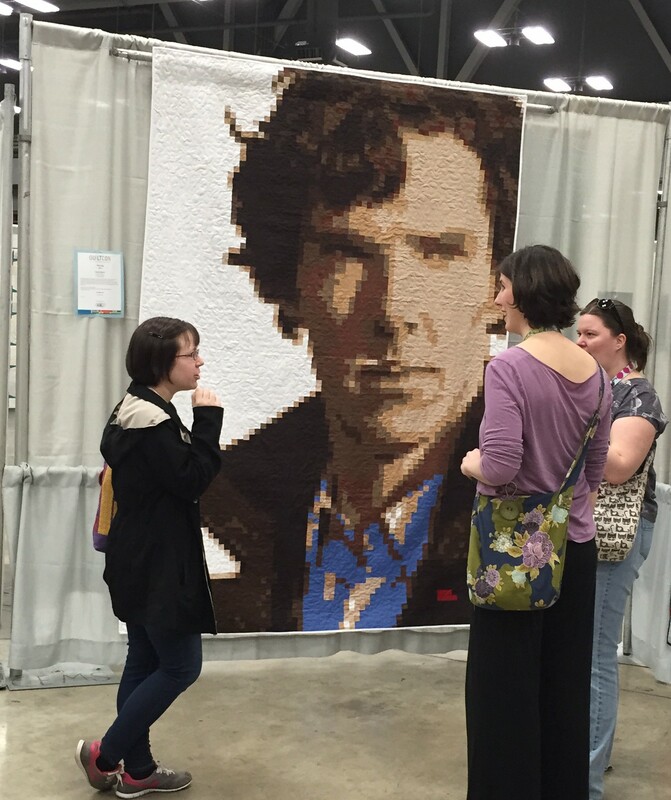 I’ve been home from QuiltCon for a good month now, but I cannot let the experience pass without some mention of the amazing quilts that hung in the show. I wish I could say that I spent hours gazing in awe at every quilt there, but to be honest, I’m SURE that there are quilts I didn’t even see. Every time I turned around, I found another quilt I had yet to see. 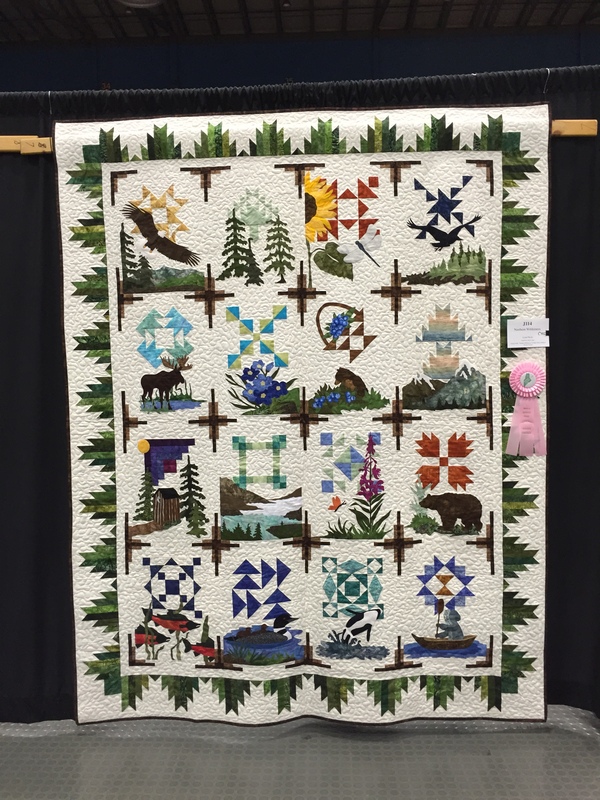 Best of show – i Quilt by Kathy York. 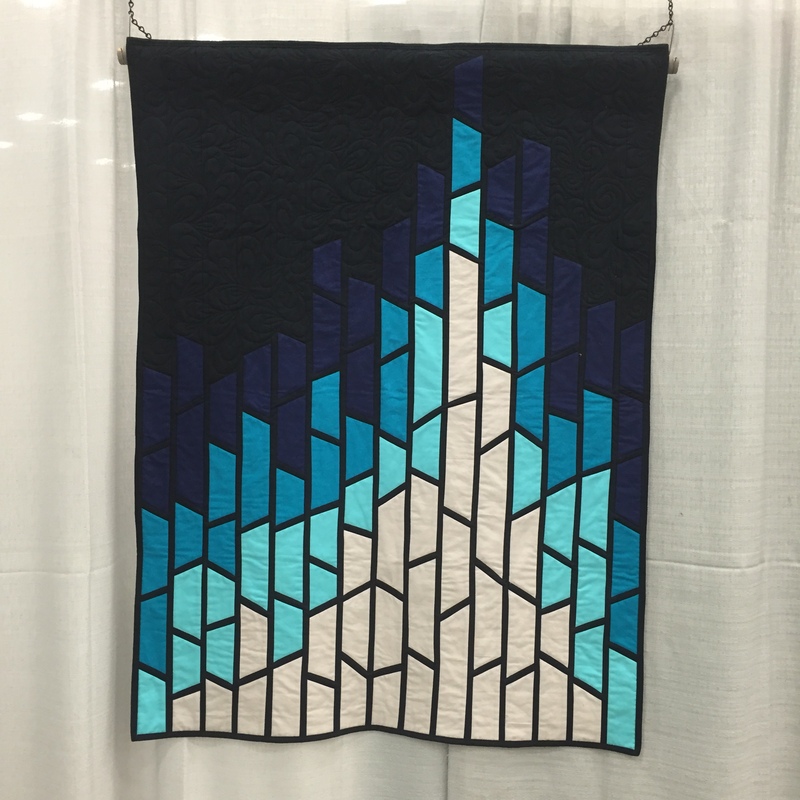 QuiltCon was my first quilt show, and it was an amazing place to begin. Every single quilt was just one more bit of inspiration, and made my brain swirl with possibility. 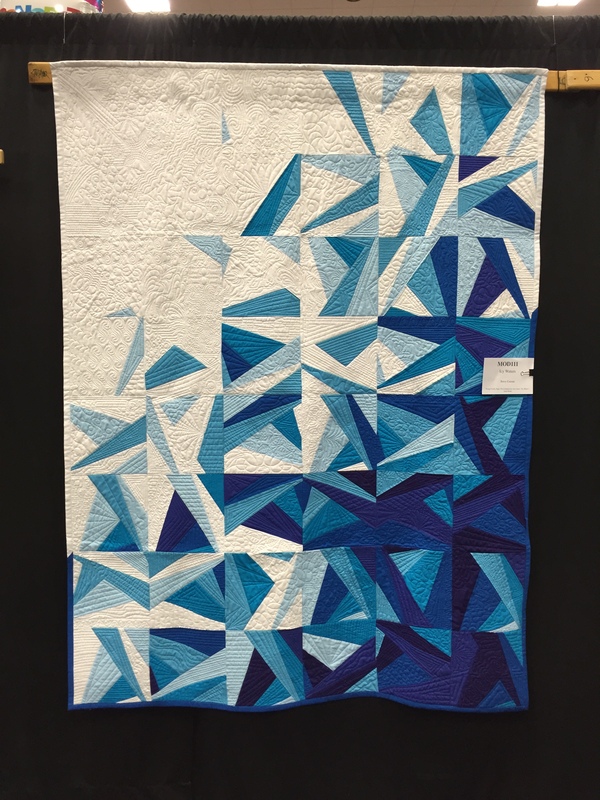 There is a lot of talk about what makes a quilt “modern”, but I think that the quilts hanging at QuiltCon definitely fit the bill, as vague and openly as that “modern” label extends. Being fairly new to quilting, there were quilts where my gut reaction was, “wow, THAT’s a cool idea/technique!”, where I had not even fathomed the possibility of a quilt made in such a way or in such a design. Like I said in earlier posts, I didn’t take nearly as many photos at QuiltCon as I would have liked, so here is just a collection of a few of my favorites. 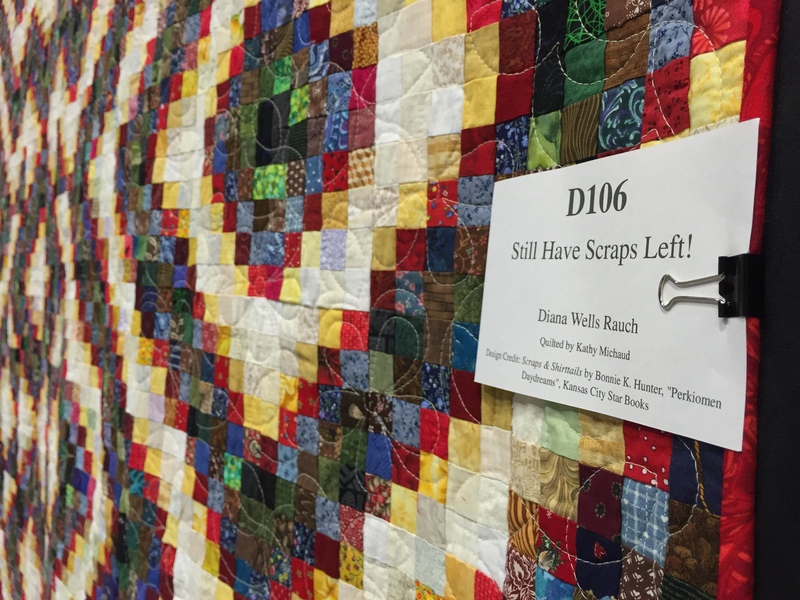 Click here to see most of the quilts from the show, care of Sew Mama Sew. Akhaten by Shannon Page. Description said: “This resulted from deconstructing my original design. I cut up the original top to make this and I could not be happier with the result.” –Can you imagine!? Now THAT is a bold idea that resulted in a cellularly fantastic outcome! Catenary by Carolyn Friedlander: even more amazing in person, if it can be imagined! I debated waiting until the crowd in front of Sherlock dissipated, but decided I really liked seeing him peek out and took the photo as shown. This quilt was one that begged to be visited multiple times! Some may be surprised that I rank this quilt in my top picks, since one might think my typical OCD tendencies might twitch at the sight of this one. To be honest, it makes me giggle with glee. What a simple yet completely unique idea. It’s a collection of yellow squares, with one out of wack. Tell me it’s not brilliant!!? In all the known quilting world, I find myself the most drawn to modern quilting and paper piecing. I’ve been designing paper pieced patterns for about a year, but still struggling with finding a way to mix the two: modern and paper piecing. Enter: Amy Garro. 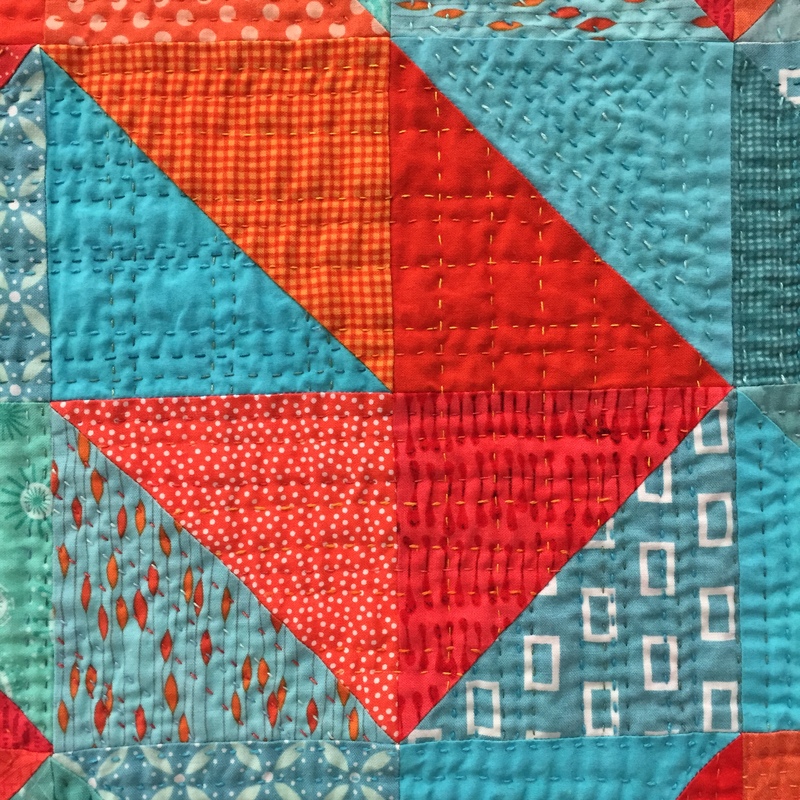 This quilt is from her new book Paper Pieced Modern*, and when I first saw it and realized it was from an entire book of awesomely paper pieced modern quilts, my reaction was, “Yesssssssssssssssssss!! 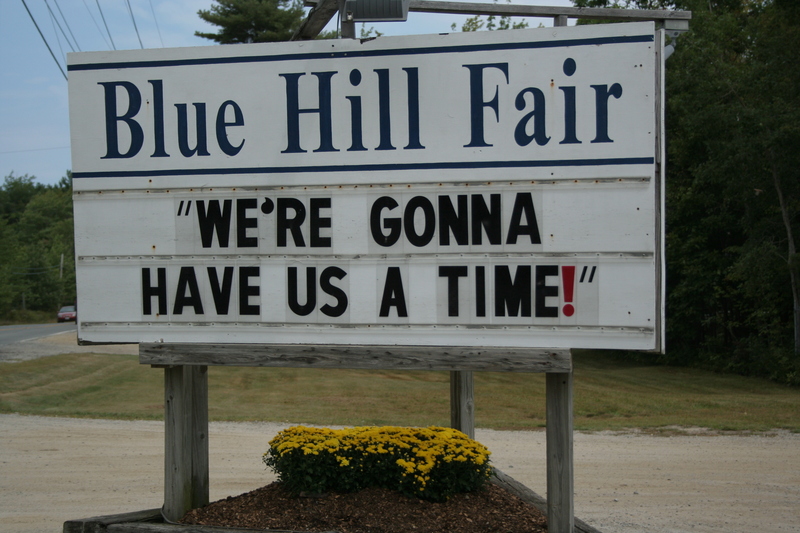 !” Let the fun begin! I most agree with Lee from Freshly Pieced‘s observation that “design is the single most important element of a modern quilt” and that “walking around the floor, it was pretty hard to miss the layout creativity that was on display.” Lee totally nailed my gut reaction mentioned above; the layout creativity blew my mind and explored design elements beyond my wildest dreams. Read her full post here. 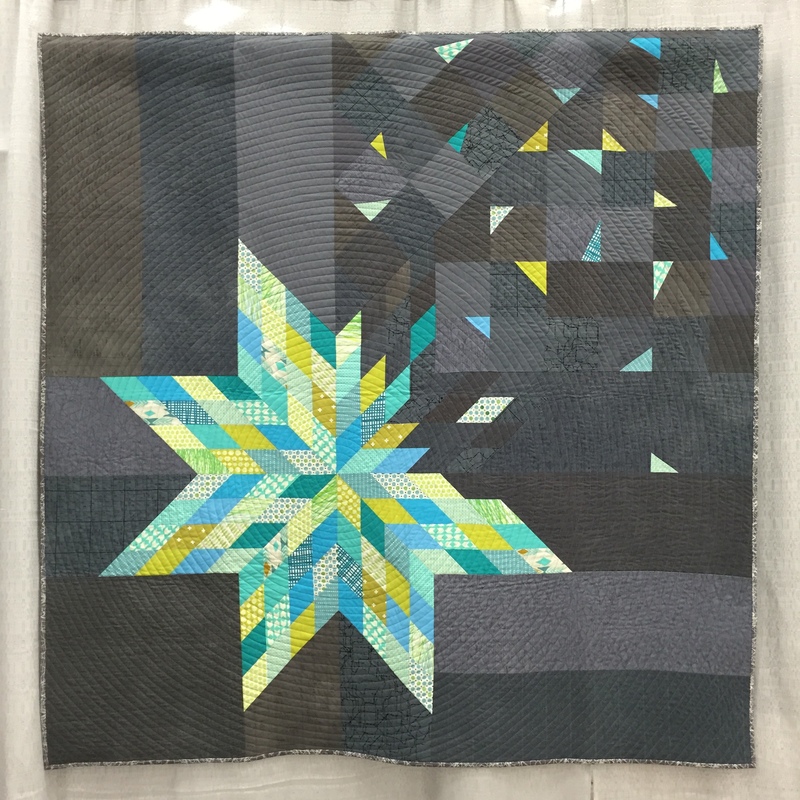 Of course, taking Lee’s Off the Grid: Alternate Layout class was an eye-opening highlight of my trip, so I may be a bit biased, but I really think that she hit the nail on the head regarding the direction modern quilting is headed. Afton from Quilting Mod noticed a prevalence of dense free motion quilting, straight line or matchstick quilting, circles or quarter circles, pixelated quilts (swoon Sherlock), quilts with actual words, gemstones, architecture, bold saturated rainbow colors, and a more lenient look at perfect craftsmanship with more of a focus on design. I definitely noticed a strong prevalence of dense free motion quilting and matchstick quilting, which is one more motivator to improving my free motion quilting skills! 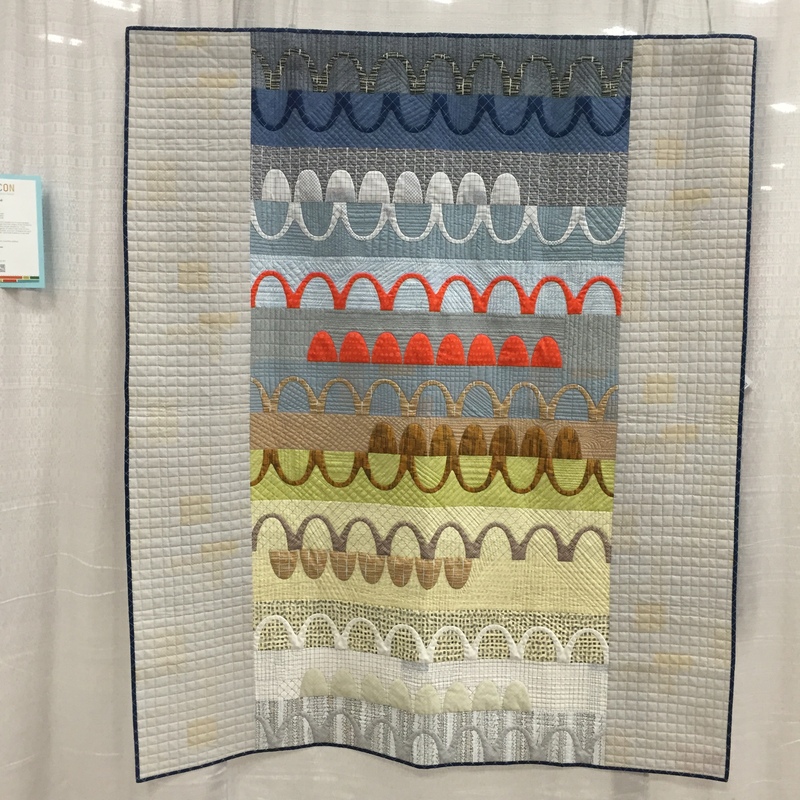 I also loved Christa from Christa Quilts‘ reflections on modern quilting post QuiltCon. My favorite bit of wisdom I got from her post was “…just because you enjoy modern quilts doesn’t mean you have to BE a modern quilter. And just because you consider yourself part of the movement doesn’t mean you have to make exclusively modern quilts.” Christa mentioned being able to see the quilters’ heart and soul going into the quilts, and I agree that so many quilts not only were aesthetically gorgeous, showed masterful craftsmanship, and exhibited a thinking-out-of-the-box design element, but they also expressed emotion. Maybe I’m just a quilting sap who found my creative niche in the mostly-modern quilting world, but the quilts spoke to me. (No, I’m not weird. Just humor me, ok?) 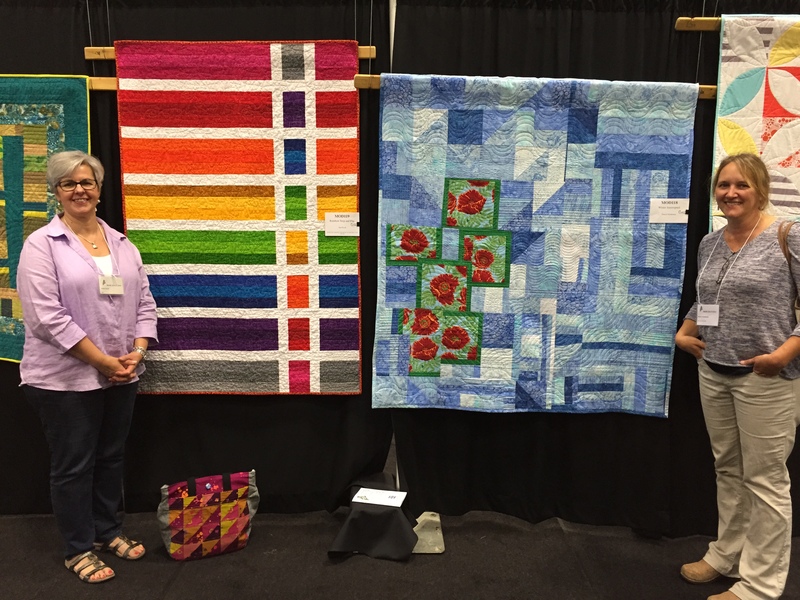 The quilts at QuiltCon were a huge inspiration for me to continue playing, creating, and stretching my boundaries. 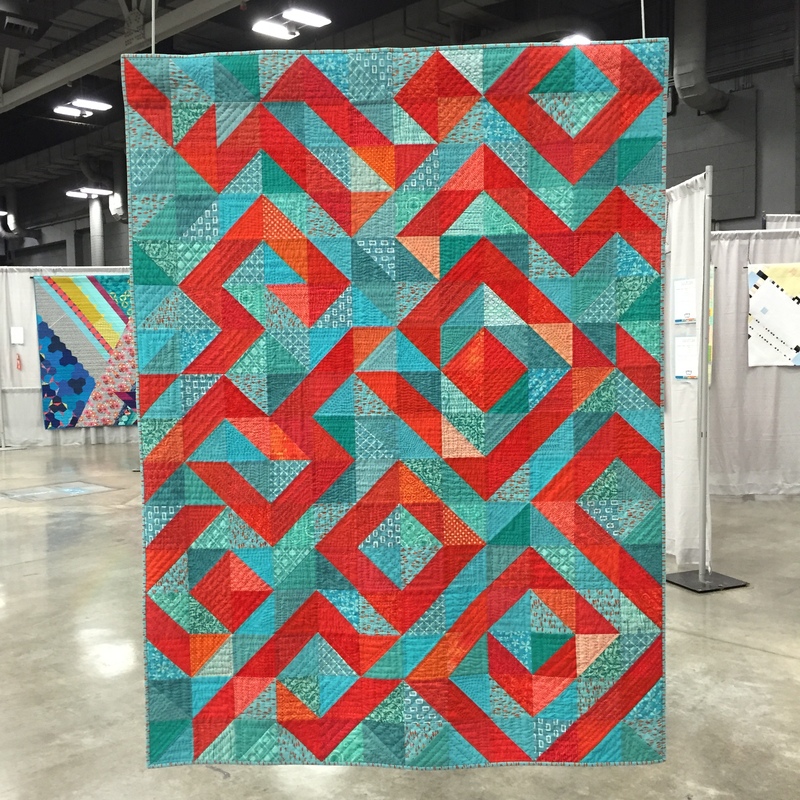 Quilting JetGirl QuiltCon 2015: Quilts! Yvonne of Quilting Jetgirl has a pretty extensive list of quilt blogger posts about QuiltCon HERE. 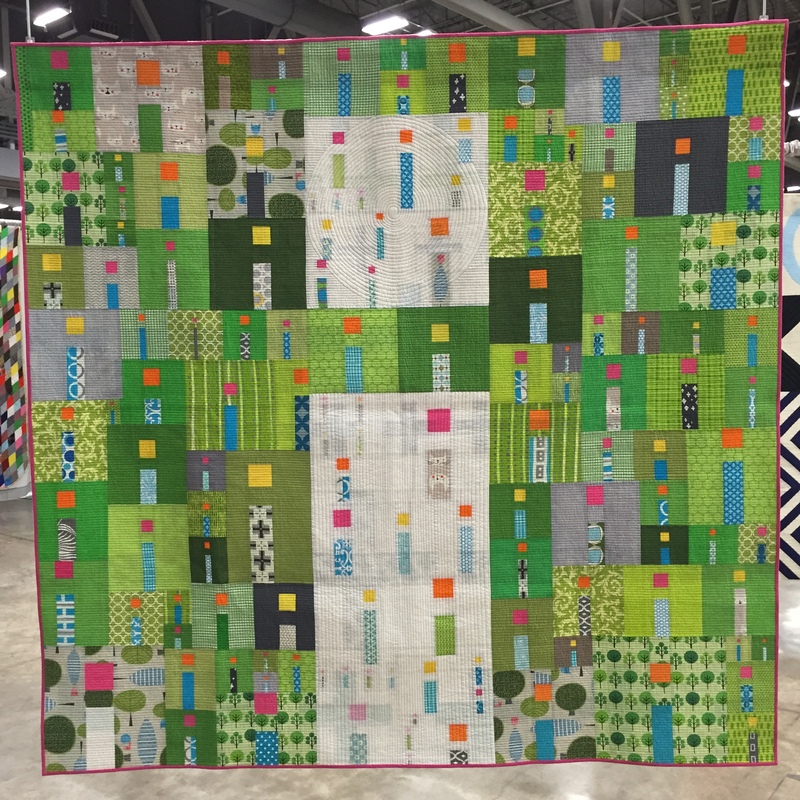 Are you a quilter blogger who also posted about the quilts shown at QuiltCon? Let me know and I’ll add you to my list above! *Amazon affiliate link included, which means if you buy Paper Pieced Modern by clicking through, I receive 4% compensation with no extra cost to you.